NEWS Concert in the artist association "Kunstnerforeningen af 18. November"
This monday, the 16th of November, we had the honor of playing a small concert at the Danish artist association “Kunstnerforeningen af 18. November”. They were celebrating their 173rd birthday, and we played a small selection of pieces by Mozart, Bach and Debussy, and of course we also played Happy Birthday, with all the members singing along! It was our third time performing at the artist association, and it was a big pleasure as always. Nice acoustics, great audience, and some of them even make small drawings of us during the performance. 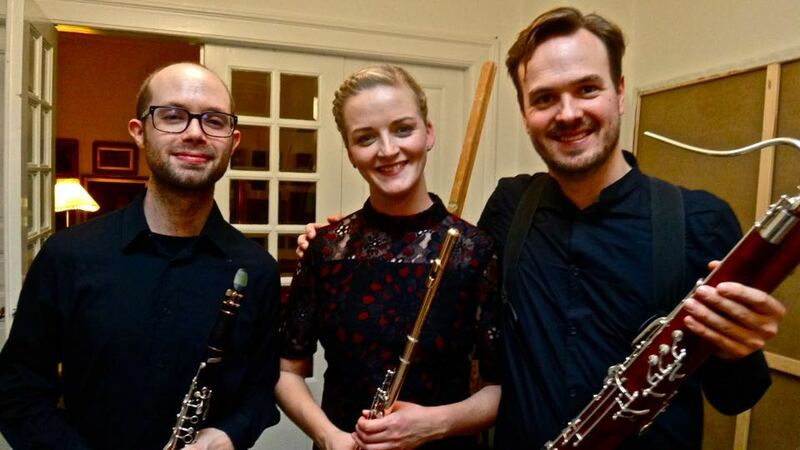 For this performance we had Lars Mathiesen playing the bassoon instead of Lucia, he has been so kind to help us out during Lucias maternity leave. Thank you so much for a great concert Lars! Here is a picture from the moment we finished our concert, taken by one of the members of the artist association.